I am married to Craig and we have two wonderful teenage girls; Tyler & Kristin who are now ready to leave the nest and find their own way in life. We have recenlty moved to Central Hawke's Bay as it has always been a dream of ours and now is the perfect time to embark on a new adventure. I am a qualified Early Childhood Kaiako with a Bachelor of Education (ECE) and have worked in this sector since 2005. My recent position was a co-ordinator for Sprouts In Home Childcare, Palmerston North. I have also worked in Kindergarten and Early Childhood Centres. My passion is teaching and learning with and alongside tamariki and their whanau. This will provide them with opportunities to develop and grow in an environment that is welcoming, nurturing and understanding. I believe that together as whanau we can ensure our tamariki are given the love, respect and understanding that they need to succeed in society. I am looking forward to getting to know you all and working with you and your tamariki. Tēna kotou, tēna koutou, tēna koutou katoa. Tuhia ki te rangi, tuhia ki te whenua, tuhia ki te ngākau o ngā tāngata, ko te mea nui, ko te aroha. Tihei mauri ora! I love working with children, teaching and learning alongside them and their whānau in the countryside where I have resided since 1976 with my husband, four married children and their wonderful spouses who have blessed us with nine grandchildren. Originally I gained a three year Diploma of Primary Teaching in Western Australia as a mature aged student after working for five years in banking and personnel administration. When migrating to New Zealand it was then illegal to employ overseas trained teachers where New Zealand teachers were available so I volunteered for ten years completing certification and working in Play-centre. Through this I bring an understanding from a migrant's perspective to my work. I also bring an understanding of challenging rural life styles through engaging in every aspect of rural work from tractor and truck driving to raising 400 calves a year. I also bring an empathy and appreciation of all things Maori through teaching with the English Department at Te Aute College for ten years. It was there where I completed my New Zealand Bachelor of Education at Massey; with papers in Special Education, the Treaty and te Kākāno o te Reo. As I have nursed matua with cancer, and supported family with premature babies my nurturing skills I bring to my tamariki. I have completed a Post Graduate Early Childhood Massey Degree and bring my commitment to further education to my philosophy.I started at Scallywaggs in 2009 Senior Kindergarten and then moved to the Junior Kindergarten. Ko Fran Gray tōku ingoa. Kia ora whānau, Fran is my name and I have just moved to Waipukurau to be closer to my whānau here and in Napier. 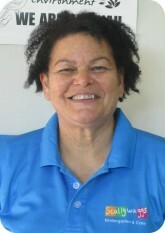 I come to Scallywaggs as a kaitiaki from managing a Kōhanga Reo in Tauranga. I enjoy my Māori culture and practicing my reo Māori with tamariki, so if you hear me speaking Māori and want to know what I said, please don’t be shy to ask. I play roller derby and also enjoy being outside so I love camping, swimming and snowboarding. I hope to learn about where our Junior centre whānau come from, your culture and interests. I have enjoyed meeting your tamariki and can’t wait to learn more about them and can’t wait to learn more about them and with them. Hi there, my name is Sarah Cudby and I have recently returned to Scallywaggs as a teacher in training where I was part of the team 16 years ago when I left to embark upon my own journey of raising a family. My husband, Aidan and I have 5 beautiful tamariki and live in Waipukurau. One of my tamariki was diagnosed with Autism when he was 3. He has taught me so much and opened my eyes to the true meaning of teaching and learning alongside tamariki, reciprocally and holistically. Letting go of preconceived ideas to think outside the box and look at things through the lens of the child that may be wonderfully multicoloured, this resonate’s strongly with Scallywaggs core values of being “committed to build and foster a sense of community that is inclusive and welcoming and respectful of the values, beliefs and practices of all cultures and backgrounds”. I’m currently studying towards gaining the Bachelor of Teaching in Early Childhood Education and are motivated and inspired to work alongside the teachers (kaiako), tamariki and whanau in a role where I am fortunate to be in a position that nurtures the early care, education, development, behaviour and potential of all children. I strongly believe that the support networks provided by the teachers and caregivers in the Early Childhood Education setting create positive differences and significant contributions in the lives of both children and whanau, this, ultimately is what I aspire to achieve most, to make a difference in the everyday lives of extraordinary children. My name is Eryn Reinicans. My Husband Dave and I have two children at Waipawa Primary School. We moved from Auckland in 2015 to Maraekakaho, we bought our first home in Waipawa in 2018 and are loving life in Central Hawkes Bay. My childcare experience includes being a Playcentre Mum for 6 years, a Nanny for 10 years and a Teachers Assistant in a private Kindergarten for 3 years. My hobbies include camping with family, creating things in my workshop from recycled wood, upcycling furniture, and gardening just to name a few. My strengths are nature play, carpentry, messy play, facepainting, crafts, water play and cuddles. Ko Hannah Peka Ngahau tōku ingoa. Tēnā koutou katoa, my name is Hanz and I’m working part time here in the Junior room. I have years of experience working with tamariki of differing abilities from various backgrounds and cultures. I have always enjoyed working with tamariki and I look forward to getting to know yours. I have mokopuna myself who I love spending time with and enjoy getting out and about in the community.